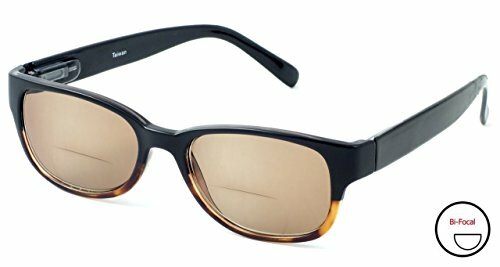 4372SB Bi-Focal Reading Sunglasses by Calabria. Stylish European designer influenced frames with a two-tone colorway. Lenses are optical quality with zero distortion and offer a reading magnification at the bottom portion of the lens and plano (no power) for the top. Choose between three beautiful colors: Black, Tortoise & Blue, and Tortoise & Pink. Frames are spring hinged for added comfort and durability. Each frame includes a soft case that helps keep the readers clean and looking fresh. The lenses are tinted, perfect for driving, lounging at the pool or beach, or any outdoor activity. Expect 100% UVA/UVB Protection.